Jaime (Zinger) and Elan Borenstein were married on 9/9/12 at Florentine Gardens in River Vale, NJ. They currently reside in Pasadena, CA. This is their story of bringing a wonderful part of themselves into their wedding and having the perfect wedding favor for their guests. Wouldn't it be great to write our own song that defines our relationship to give out as cd favors at our wedding? And, we could also turn this into our first dance song! We had never written our own song before. We thought the most practical approach would be to come up with a relevant title that spoke to us, and go from there. 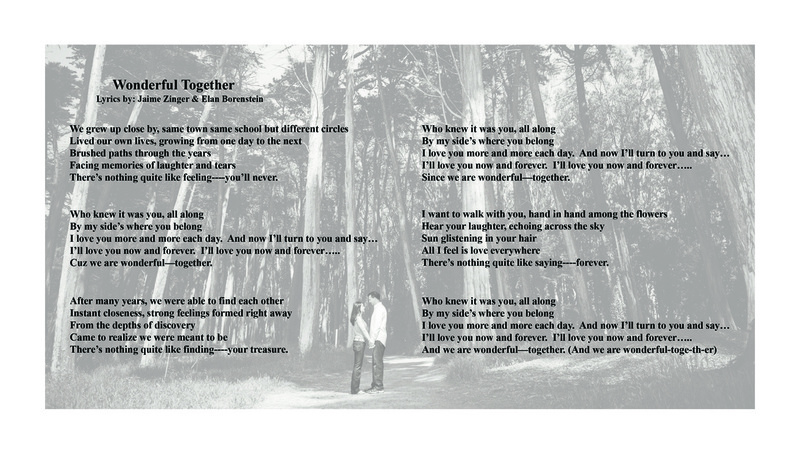 Out of the title suggestions, my husband smiled and said, "What about 'Wonderful Together'?"... and a title was born! I thought it would take months to create lyrics and a melody, but as I began thinking of our story, the words formed quickly. What was really cool, is that as the words formed, the melody followed at the same time. Words quickly tumbled from my head to paper, and pretty soon I had the chorus down. Then came the stanzas, and our song was established. Next came time to record, and this is where we got a little...creative. It is known that a bathroom carries with it great acoustics, so this became our 'recording studio', and what better instrument to use than the microphone from our Guitar Hero! Now came the subject of music to accompany the lyrics. We got in touch with my very talented uncle and musician and told him of our plan after he swore to keep it a secret. He suggested we contact a recording studio guru friend of his for ideas, and a relationship soon followed. What was really challenging was he was located in New York and we were located across the country in California. After sharing our ideas and critiquing various versions, the music was formed. Next came time to figure out how we could accomplish a professional recording session, as our bathroom and Guitar Hero microphone wouldn't quite cut it for the final version. The only time we would be back on the east coast prior to the wedding was for a crazy weekend of festivities less than 3 months away. We had to fly in on Friday to meet with all our vendors across Northern NJ and provide last minute payments, meet with family for brunch Saturday during the day, go for a final wedding dress fitting, attend a close friend's wedding on Saturday night, celebrate my bridal shower on Sunday, and fly home Monday. It was far from ideal but Monday would have to do. Needless to say, come Monday I was exhausted. We had to escape questions from our parents on where we were rushing off to only hours before heading back to CA to keep this a secret. As we headed to the recording studio, we were sent a final version of the music. Couple that with the fact that we ended up being stuck in awful traffic that made us late, I had developed a sore throat and had never recorded in a professional recording studio before, I was a bit of a Nervous Nellie. We arrived and my uncle was there to greet us and introduced us to the recording professional. As I sat in the booth and realized it was so quiet you could hear a pin drop, I simultaneously felt excited and anxious. As I heard the music begin and listened to my heart pound furiously, I prayed it wouldn't be picked up in the recording. I took a deep breath, began to sing, and away I went. The only thing left to accomplish after the recording session was packaging options for the cd. After doing research, we selected and ordered our cds. 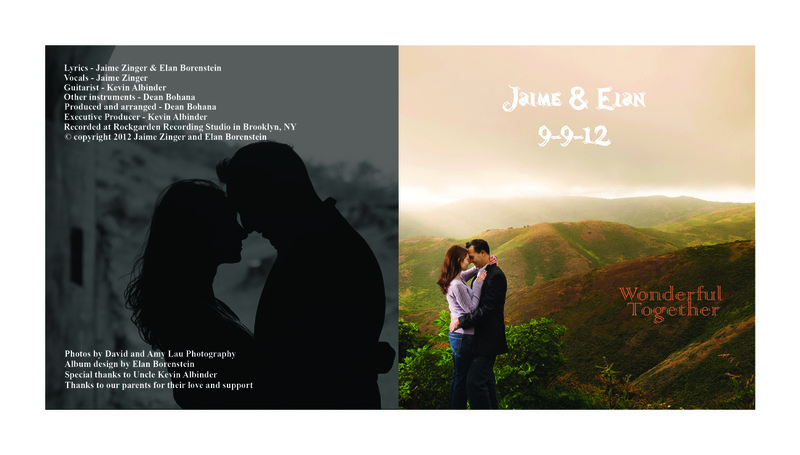 We designed the cd cases using our professional engagement photos and included both lyrics and credits. During the wedding day set-up, we ensured that an event coordinator placed a cd on each place setting, so guests could take them home. As my husband and I walked into the room upon announcement of our names as newlyweds, we took our places to do our first dance as husband and wife. As our original song began to play and we began to dance, we started hearing excited murmurs from our family. My husband and I looked at each other and smiled, for we had successfully achieved our surprise, and it was well-received by our family and friends!